In their newest issue, The Old Schoolhouse Magazine reviews MusIQ HomeSchool, a comprehensive music curriculum for homeschooling families. Imagine hearing your four-year-old play “Ode to Joy” or even “Yankee Doodle”! It could happen in your family with the help of this ingenious music program! All you need is a computer and a little perseverance. The keyboard plugs directly into most computers, and once the software is loaded, the learning fun begins! The cost of the M-Audio KeyRig 49 Keyboard is about $125, which may seem daunting. But keep in mind that typical piano lessons cost anywhere from $25 to $50 per lesson per child. So you will actually save quite a lot of money by using this program for several years or with several children. Also, the keyboard accepts headphones, so your student can focus and practice without disturbing the rest of your family. That’s priceless! 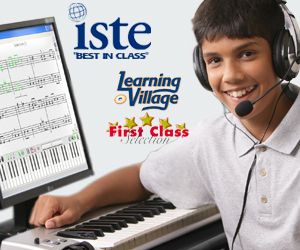 This program comes with software to load onto your own laptop or desktop computer, a special piano keyboard that plugs into your computer to use with the software application, lesson books, and some necessary cables. The piano keyboard can’t be played as a stand-alone. It needs to be attached to a computer and used with the software program. An animated instructor is visible on your computer screen, and you can see lots of information before your eyes to help in the learning process. The well-laid-out lessons are self-guided, with the student using the attached piano keyboard to “play along” with the computer program, which is visible on the computer screen. There are lessons for ages four through adult, and they cover music theory, improvisation, music history, music appreciation, and music games. It’s important to remember that this isn’t just a computer game. The keyboard is the input device into the computer, but the skills can be translated to a traditional piano fluidly. Also, some of the activities include old-fashioned coloring pages, which are always a big hit in our home! The improvisation training has turned out to be some of the most fun! The program is set up to teach the child a few key combinations that can be played with pre-programmed music on the computer, giving the child a sense of early success. The child hears some great music that they’re helping create, and the confidence boost is amazing. Our son often wanted to extend his lesson times because he was so thrilled with his progress. I also appreciated that the lessons were not too long–usually only 10-15 minutes per day. Our kids often played longer by choice and moved onto additional modules, but they rarely felt compelled to quit early. Another great bonus is the fact that the keyboard and computer are so portable. We were able to use the program in various locations throughout our home during the week. You can’t move a full size piano around your house like that! Also, you could easily load this in the car for an extended out of town visit and never miss a beat! Oh, did I mention that you can “register” more than one child on the software? When each child logs on, the lessons pick up where he or she left off! Not only is this a great learning tool for your kids, but busy parents who wish they’d stuck with their piano lessons when they were younger can enjoy learning too! Additional software for adults is available from Adventus. Try MusIQ HomeSchool Free for 7-days!